The replacement of a balky avionics box on a Russian Soyuz capsule will push back the October launch of the International Space Station's next three-man crew by about one week, Russian and NASA officials said. During standard preflight testing, Russian engineers discovered a problem with an avionics unit which controls the Soyuz descent module during re-entry and landing. Officials opted to remove and replace the suspect part on the Soyuz capsule assigned to deliver three new residents to the space station in October. The Soyuz TMA-06M spacecraft and its Soyuz FG launch vehicle are being prepared for launch at the Baikonur Cosmodrome in Kazakhstan. The flight had been set to lift off Oct. 15, but space station managers expect the launch will now occur around Oct. 22 or Oct. 23. NASA astronaut Kevin Ford and Russian cosmonauts Oleg Novitskiy and Evgeny Tarelkin are slated to spend nearly five months on the space station as part of the Expedition 33 and Expedition 34 missions. The Soyuz delay will give SpaceX more launch opportunities for its first operational cargo resupply flight to the space station, which is due to take off in as soon as Oct. 7, according to Vladimir Popovkin, head of Roscosmos, the Russian space agency. Space station officials prefer to schedule the arrivals and departures of visiting spacecraft several days apart to avoid interference and overworking the lab's crew. Another Soyuz crew launch set for December may also slip about two weeks from Dec. 5 to around Dec. 19, but a NASA manager said the schedule for that mission is still under discussion. 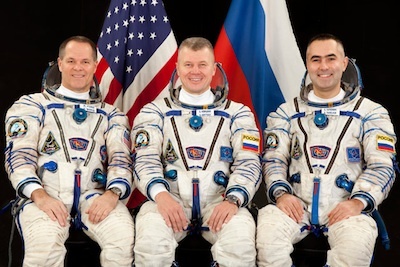 Veteran Canadian astronaut Chris Hadfield, commander of Expedition 35, NASA astronaut Tom Marshburn, and Russian cosmonaut Roman Romanenko are assigned to the December launch.